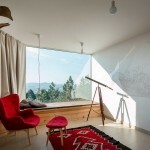 The house is located near the popular tourist resort Divcibare, on the slope of Mount Maljen in western Serbia. Although the plot has been overrun with small pine trees, it still bears the original character of the open field. 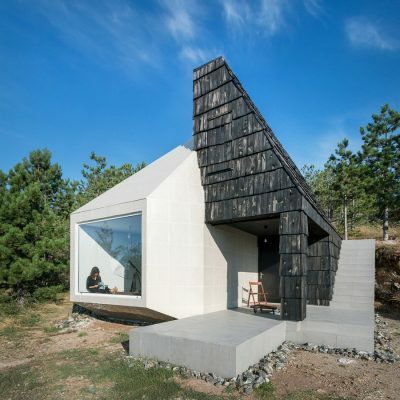 To minimize disturbance to the site and as a reference to the surrounding hilly terrain, the house is built into the hillside. 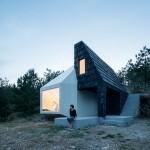 Designed by combining the two main monolithic volumes, light & dark. 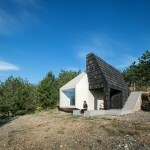 These forms merge with the natural environment of low pine vegetation and steep rocky terrain. 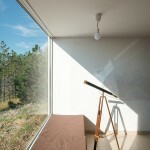 On the south side, the white portion of the house connects to the outside through a grand picture window, which guides the transition from the artificial to the natural. This side’s exterior is finished with white ceramic tiles, which emphasizes its form and gives reference to the interior function of combined kitchen, dining and living area. 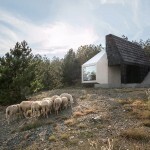 The white cladding makes this volume abstract and opposite to the rural surroundings. 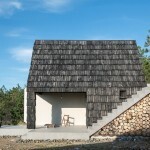 The black half of the house draws inspiration from original mountain homes. 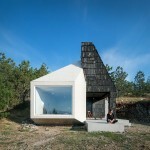 The porch is bounded on one side by the white volume, creating a sheltered outdoor space. 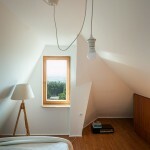 Up on the first floor is the open bedroom area providing complete privacy from other spaces. 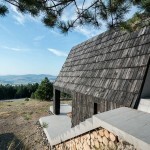 The structure is emphasized through the use of natural materials such as the traditional timber shingle cladding. 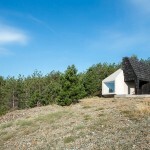 Through the duality of the house, with two main volumes; the intent was to merge the traditional and the contemporary to create a unique aesthetic and a structure sympathetic to its surroundings. The process of construction was challenging due to the inaccessibility of the site and the relatively low budget. 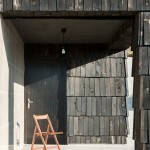 The material selection was made based on an appreciation of economy, durability and to compliment the form. Sourcing timber from local forests and utilizing other local materials was a must.